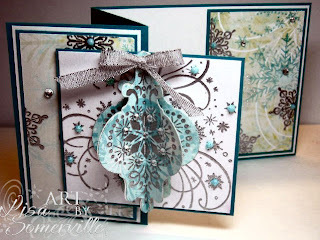 I'm thrilled to share with you two of the cards I created with images from Heartfelt Creations Winter Wonderland Collection. The Winter Wonderland Collection features 9 new Pre Cut Stamp Sets. These sets coordinate with 1 new exclusive Heartfelt Creations die made by Spellbinders and 1 existing Snowflake Wonder Spellbinder Shapeabilities. I silver embossed Snowflakes from the Snowflake Medley Set, on the pattern paper, then to my layers and Z Fold panel as shown. Emboss the Swirl in Silver on Shimmer White panel, attach to Teal panel, then adhere left side with dimensional to card base. Attach Gems as desired. Silver emboss ornament from the Ornament Medallion set on Pattern Paper; repeat two more times, die cut image using Holly/Ornament Die. Score image down center, adhere ornaments together to create a 3D look. Attach gems as desired, then to card as shown. Tie Silver Ribbon with Bow Easy, attach to ornament with Glue Dot. The swirl from Snowflake Medley is Silver embossed on shimmer paper, then I added some Silver Flourish Gems. The snowflakes are created by Silver Embossing the Snowflake Medallion images (6 large, 6, small) and die cutting them with the Holly-Ornament Die, then popping them up over the embossed swirl as shown. The center is a Facet Gem, with a piece of card stock attached to the center. Thanks so much for stopping by! Click Here to view all the new product at Heartfelt Creations. To celebrate the new release they will be giving away the complete release valued at $159.00 to two lucky winners. Leave a comment on the HC blog or the HC Facebook page by October 5th to be entered to win. The winners will be announced on October 6. Amazing detail in these beautiful projects. The concept is so amazing, you sure have enabled us again. Off to enter the contest, thanks. These are spectacular, Lisa! So much detail and beauty. Your projects are always incredible! Amazing detail is so right. The Z fold is just gorgeous and I love the way you used the gem on Santa's face. Both are just so perfectly detailed! These art works are stunning. Everytime I think I've seen you at your best, you come up with something more spectacular. WOW Lisa! These are AWESOME! Fabulous details w/fabulous bling! Stunning and Stunning. Love all the details and beautiful gems! gorgeous, love the fold of the card and the colors of it.